As some of you may know, Heavy Rain impacted on me heavily, resulting in a fortnight or so where I only played Forza Motorsport 3 as I just wasn’t interested in nor ready for a game with a narrative of any kind. 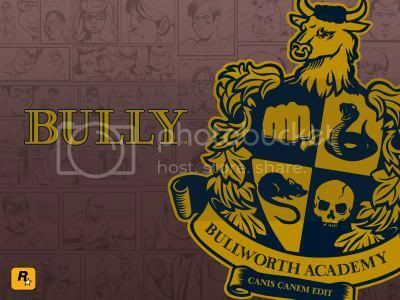 In some ways, this is still the case, so I think I was right to choose Bully -- also known as Canis Canem Edit -- as my next game. While it does have a narrative of some sort, it’s mostly irrelevant to the overall experience of playing as an aggressive, rebellious child who loves nothing more than a little -- sorry, a lot of -- mischief. And that’s perfect, as I enjoy some mayhem in my gaming from time to time too. What Rockstar’s school-based game brings to the table is a form of shenanigans that you wouldn’t normally find in most videogames, and centers the absurd antics around a theme that pretty much everyone is familiar with: school, and the various cliques, situations and frivolities that come with it. Reflecting back on my own real life schooling, I realise that despite some unfortunate factors, the majority of it was rather fun, and Bully reflects that experience through the antics that you can experiment with during play. Want to scare a group of students by setting off some fire crackers behind them? You can do it. Want to watch others kick someone because you planted a “kick me” sign on their back? You can do it. Want to hit some people with pelts fired from your slingshot? Yep, you can do that too. But despite the instantaneous fun such activities can provide, these moments haven’t stood out to me in the way I was expecting. Sure, they’re fun, and it’s great being able to think about what I can do next to have a bit of a laugh, but they are also mostly predictable, too, and as a result I feel like they will get old quickly. Something that has already gotten old, quickly, is the style of gameplay that Bully immerses itself in. Within moments of playing it, I realised that, mechanically, this was a last generation game. That’s not to say it’s bad -- quite the contrary actually -- but you could tell, despite playing it on the 360 (yes, I realise it was a port), that it was a reinterpretation of the old Grand Theft Auto formula, where fun and insanity are emphasised and where careful maturity and realism need not apply. In fact, it feels so much like GTA III and company that you could almost get away with calling it a re-skin, and while going with such a popular formula is not a bad thing, I can’t help but think about all the potential the game could have, or would have, were it to have its own identity -- so to speak. This also applies to a more broad thought I’ve had while playing the game, in relation to Grand Theft Auto IV and the way its two downloadable episodes changed up the original game just enough to provide a fresh, unique perspective on a familiar place. I can’t help but imagine -- and I’m sure I’m not the only one to do so -- what a ‘Bully’ episode set in Liberty City would be like, the city’s size and methods of transport drastically changing due to the difference in being a child versus the adults we’re more familiar with. In fact, I’d like to explore this idea a little more, so expect a few more posts on Bully in the near future. In the meantime, my time with Bully so far leaves me thinking about what could have been rather than what is -- I’ll let you decide whether that’s a positive or negative impression, though. Man, I am so with you on that one. I would've loved nothing more than to have seen one of the GTA episodes feature boarding-school kids in Liberty City. The possibilities are endless. Are there rumors of a Bully 2? I kinda think there are... if they do make one, and they use the RAGE engine, it could really be quite the thing. I hope they bring Shawn Lee back to do the music. Kirk -- Since it seems basically guaranteed that Rockstar are working on Grand Theft Auto V (or at least, another 'proper' version), I'm curious to know if the downloadable episodes were experiments, of sorts, with what they could do within the fully-fledged city(ies -- for the future, maybe) they had built. If they were, then perhaps what the next game may bring is what we seem to desire: multiple stories told within the city, that drastically change the perspective of it and what can and can't be done in it. My imagination is going wild with such a thought already, so I hope to hell that's the kind of direction Rockstar are taking. As for a possible Bully sequel, I've heard the murmurs but I'm not sure really. Was the game a success? And didn't Shawn Lee himself mention he was working on it? That sounds familiar - Shawn Lee mentioning a sequel kinda pings my memory. I hope they are, anyway. And yeah, I also hope that they will step beyond simply delivering more GTA in episodes in the future and really change the paradigm. Also, I look at some of the user-created expansions to Oblivion and FO3 that I never got to play (since I played those games on 360) and I wonder, if such a toolset were made available for the PC versions of GTA, what kind of brilliant stuff we would see. Play through liberty city as a dog, for example? A city-wide empire-building game where players based around hot dog vending? Ye gods, the imagination soars.